The Hot N Cold Fantasy Baseball All-stars for Fantasy Pros 911: http://fp911.com/the-hot-n-cold-fantasy-baseball-all-stars-6/. The roto analysis includes: Elliot Johnson, Daniel Nava, Brandon Inge, Roger Bernadina, Danny Espinosa, Gregor Blanco, Ryan Doumit, David DeJesus, Yonder Alonso, Kirk Nieuwenhuis, Seth Smith, Scott Diamond, Christian Friedrich, Bruce Chen, Patrick Corbin, Justin Masterson, Jarrod Parker, Daniel Bard, Ross Detwiler, Pedro Alvarez, Rickie Weeks, Dee Gordon, Jordan Schafer and much more. A Baseball Show with No Name with Joel Henard & Albert Lang will air at 700: http://www.blogtalkradio.com/thefantasyinsiders/2012/05/14/a-baseball-show-with-no-name-with-joel-henard-albert-lang. We’ll talk Josh Hamilton, Chris Sale, Orioles, Dodgers, Indians, Nationals, Lance Berkman, Wilson Ramos, Nolan Reimold, Desmond Jennings, Rickie Weeks, Mike Moustakos, Kenley Jansen, Matt Moore, Billy Butler, Jose Altuve, Shane Victorino, Andrew McCutchen, Trevor Cahill, Bryce Harper, Brian McCann, Alex Rodriguez, roto, fantasy baseball and much more. The Hot N Cold Fantasy Baseball All-stars for Fantasy Pros 911, includes Will Middlebrooks, Allen Craig, Kyle Seager, Chris Johnson, Carlos Ruiz, Pedro Alvarez, Gordon Beckham, Jed Lowrie, Brandon Snyder, Jarrod Dyson, Wilson Betemit, Alberto Callaspo, Andy Dirks, Carlos Zambrano, Jeff Samardzija, Jerome Williams, Joe Blanton, Jake Arrieta, Felipe Paulino, Rick Porcello, Matt Harison, Matt Moore, Rickie Weeks, Joe Mauer, Eric Hosmer, Brandon Phillips, Mike Aviles, Ben Zobrist and much more: http://fp911.com/the-hot-n-cold-fantasy-baseball-all-stars-5/. Will Carroll and April Whitzman join the guys on BDD Radio at 7:00 ET: http://www.blogtalkradio.com/thefantasyinsiders/2012/03/26/baseball-daily-digest-radio-with-joel-henard-and-albert-lang?utm_source=BTRemail&utm_medium=ShowReminder. We’ll talk Brian Matusz, Nolan Reimold, Josh Willingham, Ben Revere, Buster Posey, the Blue Jays, Adam Lind, Travis D’Arnaud, Anthony Gose, Brett Cecil, Kyle Drabek, Noah Syndergaard, Henderson Alvarez, J.P. Arencibia, Carlos Gonzalez, Jonathan Sanchez, Justin Morneau, Chris Sale, Chase Utley, David Wright, Michael Morse, Joba Chamberlain, Pedro Alvarez, Julio Teheran, Giancarlo Stanton, Zach Britton, Scott Baker, Asdrubal Cabrera, Neftali Feliz, Rajai Davis, Alex Presley, Tyler Pastronicky, Mike Trout, Bryce Harper, Michael Bourn, Matt Holliday, Mike Napoli, Rickie Weeks and much more. You’re hitting the tough part of the fantasy baseball season. At this point you’re really doubting your struggling stars and the urge to drop is high. But it’s still somewhat early. Patience isn’t always a virtue, but, in this instance, it is. Players who will bounce back: Dan Uggla, Evan Longoria, Carl Crawford, Alex Rios, Ubaldo Jimenez, Max Scherzer, Chris Carpenter, and Mat Latos. Remember when I said Anibal Sanchez was a sleeper this year? 13th in Ks right now! I love James Shields (always own him), but he’s not the second best fantasy pitcher…right? Can’t be…. One thing I am certain of? Kyle Lohse is not the third best pitcher in fantasy (maybe on his team, but not in baseball). I’m amazed by the Marlins – Johnson injured, Hanley not so good/injured. I thought they’d be good, but had you told me about their injury woes and the craptastic way Vazquez has pitched, I’d be shocked they were in the play-off hunt. That said, I still think the Braves run away with the Wild Card. Surprise, surprise, Lance Berkman is the top first baseman and my boy Zobrist is in the top 5. Expect Fielder/Pujols to replace them, with Teixeira and Howard filling out the top seven. Just a crazy deep position – I feel bad for those stuck with Justin Morneau and Kendrys Morales. The Orioles have some buy low guys…Guerrero, Scott. How is the human body so different from vessel to vessel: Holliday/Dunn, Bay/Morneau. 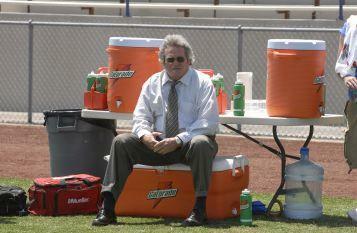 When it is Buddy Garrity sales time, you should be moving players right away. These are players that, I think, will regress to means or not perform as well as they have been (i.e. sell high candidates). In addition, they include guys I don’t think will perform well at all during the rest of the season – i.e., those players you are best cutting your losses with. Meanwhile the Don Draper sales time requires that you be more of a sly trade partner. I advocate giving a range of players that are available. Include those players who you think might be slightly overvalued by your trade partner If he is interested, cite the positive stats of your Don Draper candidate. However, don’t seem eager. The best reaction to a trade proposal is a slow one. Take your time, be fair and vague, like how Don Draper picks up women. I don’t love Edward Norton because he’s an Orioles fan (although that doesn’t hurt). He is a steady-as-you-go awesome actor. The players in his group can’t be moved for fair market value and shouldn’t be dropped in any competitive league. They’ll likely rebound to near draft value so don’t sell low. Instead, you should buy low on those players. David Ortiz – Some people still believe Ortiz is a viable buy-low option. I disagree. Maybe Papi, instead of getting upset at Manny, should ask for a little help. Yeah, I went there. If you can trade Ortiz for anything, do it. Here are some numbers: 54, 35, 23, 0 – those are the HRs Ortiz hit in 2006, 2007, 2008 and 2009. Ortiz has paired those 0 HRs with a robust .208 AVE and a .318 OBP. Once pitchers come around that Papi is no longer Papa Doc, then that OBP will drop even further. If you have Boston fans in your league, see if you can get anything for Papi. Jonathan Broxton – This isn’t an indictment of Broxton’s season (30 Ks, nine saves with a 1.50 ERA and 0.61 WHIP in 18 IPs) by any stretch. Still, saves are saves, if you can get a lesser closer and upgrade at a hitting position, I’d trade Broxton now. He shouldn’t continue to post a sub-1.00 WHIP for the rest of the season. Brandon Morrow – The news cycle moved blindingly quick as I put this list of players together on Friday. It soon became clear that David Aardsma is Seattle’s closer. If you can trade Morrow great, but in 10-, 12-team leagues you should drop him outright. I could have just written: Weeks out for season, Quelle Surprise!?! This could clear the way for Mat Gamel to get more playing time. See if he sticks. Ryan Franklin – See Jonathan Broxton. Closers are closers, saves are saves, I think therefore I am. If you can pair a closer with one of your hitters for a hitting upgrade and closer downgrade do it. Jered Weaver – What a start for Jered Weaver (2.45 ERA, 0.94 WHIP, with 35 Ks in 47 IPs). If you look deeper into his stats, however, you realize that he has five home starts and only two away starts. In 41 career home starts, Weaver has a 3.15 ERA and 1.15 WHIP. Meanwhile in 43 career road starts, Weaver has a 4.04 ERA and 1.30 WHIP. In addition, Weaver’s BABIP is low and his stranded runner rate is high. When those are corrected, his ERA and WHIP will go up. I’m not saying he won’t have a good year, but if you can get people to buy on his strong home start, you should be dealing. Dan Haren – Haren is a top five pitcher right now. So why do I suggest moderately attempting to move him? While he has a 2.09 ERA, 0.86 WHIP and 56 Ks in 56 IPs, Haren is a career first half player. Haren’s first half ERA/WHIP is 3.23/1.09, while his second half ERA/WHIP is 4.12/1.33. Haren has great Junes, so you might want to keep him around into the middle of next month. However, since it takes awhile to deal a blue chipper, I’d start subtly shopping Haren now. Dustin Pedroia – Pedroia is only .009 off his batting average pace from last year, while his OBP is .030 higher. However, if you look deeper, he has four SBs in seven attempts, while he had 20 SBs in 21 attempts last year. Expecting a repeat in SBs is probably not going to happen. In addition, while he only had four HRs through the end of May last year, can you really expect 15+ HRs from Pedroia? He does have a 162-game career average of 13 HRs. If someone is willing to pay a top five second baseman price, I’d move him. Adam Jones – I love Adam Jones. I love the Baltimore Orioles. Am I trying to reverse jinx him? Maybe. However, I can’t help but draw parallels between Jones’ start this year and Justin Upton’s start last year. Upton hit eight HRs through the end of May and only seven the rest of the season. Jones’ batting average has to come down, probably by 80 – 100 points. When that happens, will he press? I hope not. He has massive talent, but if someone thinks this will continue, I’d move him. A 20-20 season is not out of reach, by any stretch, but I’m pretty sure he has already had his best month/month-and-a-half of the year. Torii Hunter – I loved Hunter before the year (and drafted him in my HR league). Still, not even I thought he’d have nine HRs on May 17. In 2006 and 2007, Hunter, at ages 30 and 31, hit 31 and 28 HRs. So it wouldn’t be shocking if he managed 27-32 HRs, though I’m not sure that it is likely. Hunter also has five SBs, while his highest total is 23 (surprising, no?). Hunter has had a nice start – but if the other managers in your league think this will continue, take the opportunity to rob them of a slow starter. Durability is a red flag for pitchers. You have no idea who will be there for you down the stretch. While I love Wandy, I can’t buy him both staying completely healthy and continuing to be super dominant. If you can get $0.90 on the dollar, I’d move him. Still, you don’t have to. Geovany Soto – Soto has been mostly bad (.202 AVE, .321 OBP, one HR, and 10 RBIs) this year. In the last week, however, Soto has hit .333 with a .421 OBP. The Cubs catcher missed a ton of time due to the World Baseball Classic, and he is possibly now rounding into form. Those of you who held tight, you can now begin to relax your grip a bit. Dan Uggla – Uggla defines streaky. He has been on the bad side of streaky so far (.187 AVE, .303 OBP, four HRs and 21 RBIs). However, this isn’t odd for Uggla. I’ll throw some more numbers at you: .255, .347, .264, .190, .217 & .258. Those were Uggla’s batting averages in every month last season. Some were great, some serviceable, some miserable. You have to deal with the miserable – roller coasters are meant to be fun, no? J.J. Hardy – Hardy does not get off to good starts (.229 career AVE in March/April, .273 in May, and .244 in June). This year has been no different (.218 AVE and .301 OBP, though he has hit five HRs). You should wait him out – as the summer heats up so does Hardy. He’ll be money down the stretch. Jon Lester – Lester has been struggling (6.51 ERA and 1.62 WHIP). In 2008, Lester posted a 4.31 ERA and 1.54 WHIP in March/April. Lester could be a slow starter. Also, he hasn’t been useless this year. He does have 54 Ks in 47 IPs – which is awesome. That K-rate suggests he’ll turn it around. Stats as of May 16.